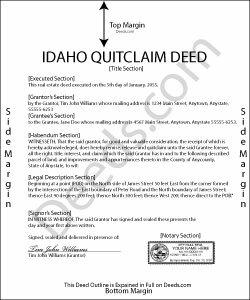 The State of Idaho does not have a statutory form for quitclaim deeds. Instead, the requirements are spread out in different parts of the statutes. Idaho Code 55-505 (2012) defines a conveyance as a transfer in writing. I. C. 55-601 expands on this definition by explaining that a conveyance of real estate must be in writing, signed by the grantor or authorized agent, and also include the grantee's name and complete mailing address. To be accepted for recordation, I. C. 31-2410 notes the need for the name of the individual requesting the instrument's recording, while I. C. 31-2413 lists the items the recorder must present in a reception book. In addition to the information above, a valid quit claim deed must contain a title clearly representing the character of the document and a legal description of the property. Additionally, I. C. 55-612 relates the covenants associated with the word "grant." Because quitclaim deeds contain no warranties, this word should not appear in the text of the conveyance. I. C. 55-818 mentions additional requirements, including the execution date (when the quitclaim deed was signed) and a description of the interest or interests in the property created by executing the deed. I. C. 55-1007 explains that if the conveyance relates to a parcel of land classified as a homestead, the spouse of the grantor, if any, must sign the deed as well. Finally, I. C. 73-121 states that all documents submitted for recording in Idaho must be in English or be accompanied by a certified translation. When submitting quitclaim deeds for recordation in Idaho, follow the sizing requirements set by I. C. 31-3205, which sets the limits to legal-sized pages (8" x 14"). Standard letter size is also acceptable (8" x 11"). I. C. 55-808 states that the instrument must be recorded in the county where the land affected by the transfer is situated. Idaho follows a "race-notice" recording statute as codified in I. C. 55-811: from the time a conveyance of real property is accepted for recording by the county officer responsible for maintaining land records, the public is served with constructive notice about the change in ownership. I. C. 55-809 asserts that an "instrument is deemed to be recorded when, being duly acknowledged, or proved and certified, it is deposited in the recorder's office with the proper officer for record." Despite the fact that I. C. 55-815 validates unrecorded transfers between parties, I. C. 55-812 discusses that a deed must be recorded or the transfer of title is void against a future bona fide purchaser (buyer for value, usually money.) In other words, even though quit claim deeds contain no warranties of title for the grantee, recording the document as soon as possible after execution enters the transaction into the public record, preserves the property rights conveyed in the deed, and protects the interests of all parties. Reply from Staff: Thanks Lynd. Reply from Staff: Thank you for your feedback Angelique, we appreciate you. Have a great day! Jack S. said: Excellent and timely responses. Do you offer an annual rate? Thank you. Reply from Staff: Thanks again Jack. Unfortunately we do not offer any annual rates or subscriptions, sorry.